In the summer of 2013 I decided to try something a little different for a summer vacation and planned a week trip biking around some of the Southern Gulf Islands and Vancouver Island between Duncan and Nanaimo in British Columbia, Canada. Here’s what happened. 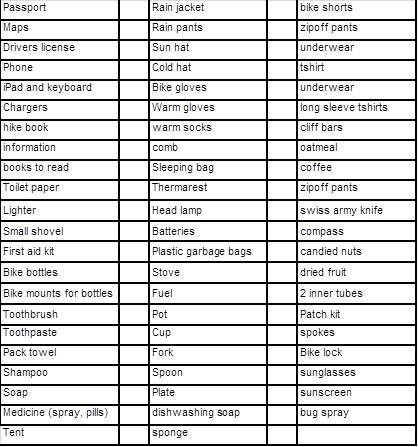 July, pre trip preparations: Being a list maker, I make a list of what I should take on this trip. Some things, like the ipad keyboard, are never used but most items are. A week before the trip I load most of the equipment into my panniers and go with my son to Golden Gardens in Seattle to practice biking with a fully loaded bike. We bike a quarter mile south along a level, paved bikepath before turning around and returning to the car. Other than feeling like there is molasses instead of grease in my axles, the test goes fine and I am confident that I can easily handle biking around the Gulf Islands. I will be proven wrong. Monday, July 22nd, 5:00AM: I wake up, ready to drive the three hours to Tsawassen and allowing plenty of time in case of border snafus. My ferry leaves at 10:45. After a quick breakfast I leave the house. 8:45AM: There is no traffic at the border and I arrive two hours early, which turns out to be fortunate. After putting my car in long-term parking, I laboriously transfer my bike over two knee-high concrete barricades, forgetting each time that this would be easier if I removed the panniers and moved them over separately. In the process I drop one of my bike gloves, something I don’t notice until I’ve already entered the ferry waiting area. The ferry personnel let me retrace my steps–Canadian kiosk operators are very relaxed–and I retrieve my glove and get back to the waiting area in time to catch the BC Ferry that hops from island to island. My destination is Galiano Island for my first two nights. In the waiting area I chat with other bicyclers, including a young man named Collin who is on his way to Pender Island to visit family. He describes how he works for a startup in Vancouver, VoltageCRM that does sales forecasting and customer-relationship management (CRM). We talk about things like trip tracking apps, new technologies, and how Vancouver is becoming a great spot for software developers. We’re both interested in how models for profit in software are changing and spend some time debating subscription versus versioning-based models. His company is leveraging the cloud and analytics to help clients manage their salesforce. 11:45AM: The ferry arrives at Galiano and I experience my first attempt at biking off a ferry. Normally bikes leave first, which means they are being chased by cars all the way up the ramp. This provides a welcome incentive since, as at every ferry terminal I arrive at on this trip, the exit ramp is an uphill climb. I immediately realize that biking on a flat surface with loaded panniers is very different than biking up even a gradual incline. I rapidly downshift into gears I never use in Seattle. I will find myself using those gears almost exclusively throughout the trip. 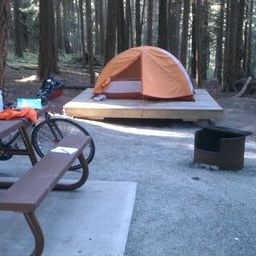 I have reservations at Montague Harbour Provincial Park for the next two nights. The park is 8 km from the ferry terminal and I quickly pass through the small ferry terminal town of Sturdies Bay, picking up a tourist map of Galiano Island at the top of the hill leading away from the ferry. Along the way to the park, as I bike along Sturdies Bay road I catch glimpses of Whaler’s Bay to the north every so often, and though there is no shoulder the few cars on the road give plenty of space when passing and I feel safe. After a few kilometers, the Hummingbird Pub provides a nice place to stop and get lunch. After coasting downhill from the pub, I start the first big climb of this trip, which shows me both how out of shape I am, and how I underestimated the effort involved in hauling gear on a bike. Feeling some embarrassment, I end up walking my bike while still several hundred meters from the top. Still, this is the highest point along the way to Montague Harbour and I get to my campsite without having to dismount again. After setting up my tent on the well constructed wooden platform and taking a look around to locate the water spigot and bathrooms, I realize that I want nothing more than to take a nap, and so I do. 4:00PM: The weather, as it will be for this entire trip, is about as perfect as it can be. The days are sunny and clear, but rarely warmer than 80F. The evenings cool down but never to an uncomfortable level. When I crawl out of my tent, I decide to take the short lagoon trail around the perimeter of Montague Harbour. The trail provides pleasant views of the Harbour itself, a sheltered bay with a host of boats anchored offshore. The vegetation consists of Manzanita bushes, Madrona trees and pines, The islands are sometimes clustered so closely together, and their shorelines so convoluted, that it’s difficult to tell when you’re looking at some other part of the island you’re on, or another island across a narrow strait. 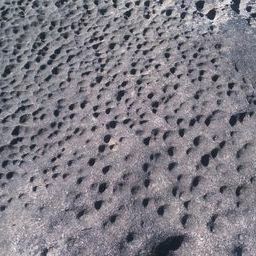 The trail leads around Gray Peninsula and brings you to a beach, where native peoples deposited middens of shells. Along the trail sandstone benches stretch out into the ocean. 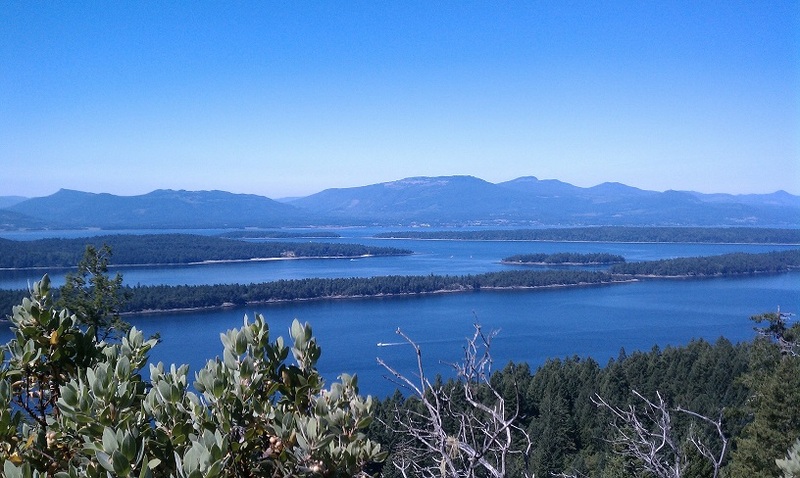 The Southern Gulf Islands are largely made of metamorphic, igneous and sedimentary rock, pushed up through years of subduction and faulting as successive land masses collided with the North American plate. 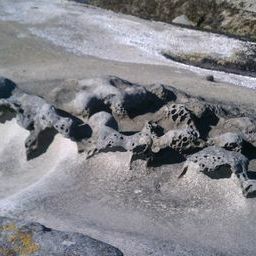 The tides have, over centuries, carved the sandstone in a number of beautiful and organic ways, from rippled planks to overhanging ledges to series of round divots. By the end of my hike, it’s feeling like time to eat and so I get my bike and go back along the access road to the park. After an abortive attempt to eat at one local restaurant that turns out to be closed for dinner, it’s suggested that I go back up the road to La Berengerie, which boasts both a high quality French restaurant in front and a much more low key Thai/Mediterranean restaurant (Café Boheme) in back. I go Mediterranean and am rewarded with a delicious Middle Eastern plate with toasted pita, delicious, garlicky hummus and smoky (but not overpoweringly so) Baba Ganoush, olives that have not come from a can, and sundried tomatoes. I chat with some of the neighboring diners and learn about the possibility of renting vacation houses and cottages around the island, as long as one is willing to stay for several days, and I file that idea away for another time when I don’t have quite as many places I’d like to visit. Another diner suggests just tramping back into the trees and setting up camp rather than reserving any place at all, and it seems that on a laid back island like Galiano that would work fine. When I get back to my campsite there is still time to walk out to the Lagoon and watch the sun setting over Vancouver Island. In the shallow water near my feet tiny crabs scuttle back and forth in Brownian motion and what mosquitos there are do not cause much distress. 3:10AM: I emerge from my tent half asleep because the tea I had before going to bed wants to be free. Forgetting that my tent is pitched on a platform raised a foot above the ground, my first step almost leads to a premature end to my trip as I pitch forward into the night. However, I catch myself before doing a full faceplant, and go to the outhouse feeling much more alert. Tuesday, 23July2013, 7:00AM: The alarm goes off but I choose not to get up just yet. The one problem I have with camping is waking with a very stiff back. My 15 year old thermarest may be the culprit and upon my return friends urge me to upgrade. Still, one advantage of traveling alone for this trip is the lack of any time pressure. Even ferries cause no distress, as in almost all cases another will come along soon enough. This unscheduled existence will take a few days to sink in. After a quick breakfast of oatmeal and coffee, where I get to try my new GSI stove, I head out along Galiano’s central road to the trailhead for the Bodega Ridge Trail. Galiano is a long, skinny island, aligned northwest, with most of the services near the ferry terminal on the southeast part of the island. Bodega Ridge is about halfway along the island and it takes me about an hour and twenty minutes to get there, going up and down several small hills and passing numerous pottery stands and other artist studios. But, it must be noted, no real places to get water. Not for the last time on this trip I realize I should have packed additional water bottles. Still, I get to the trailhead about 10:30 and lock my bike to a handy tree. A very loud, large white dog helpfully barks at me the entire time from behind a gated driveway, distracting me from how wobbly my legs feel. I start hiking along the Bodega Ridge trail, breaking out of the trees and to the ridge after about a kilometer. The views to the south- and northwest are spectacular. In the foreground Salt Spring Island rises across the Trincomali Channel, and I try to figure out where my campground will be when I go there. Beyond, Vancouver Island stretches north and south, and to the north plumes of smoke rise from a factory. In the distance I think I can see Nanaimo, where I will eventually end up, and the distance, from here at least, seems much more daunting than when I was figuring out this trip on Google Maps. 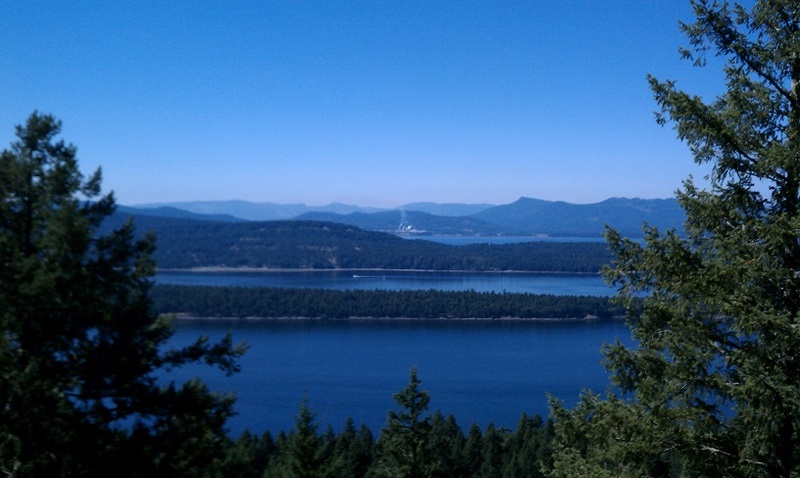 Looking out over the Southern Gulf islands from this vantage point gives allows an appreciation of their beauty as a formation, as a natural expression and summation of geology and weather and time. The vista of the islands isn’t markedly dramatic, although perhaps I’ve become spoiled in the Pacific Northwest where dramatic landscapes are a simple fact of existence. On any clear day in Seattle I can see a volcano nearly three miles tall stretching head, neck, shoulders and torso above the skyline to the south. But there is beauty and then there is beauty, and these islands have their own sort. Some years ago I saw the singer Dar Williams perform and, in introducing her song “Iowa,” she described her inspiration in the gently rolling landscape of Iowa. She described it as “bosomy,” which is a phrase I’ve always remembered and which also applies here. The gentle peaks of the islands rise up from the flat ocean calm. Coming back I decide to bike into town for lunch and take a different road to get to Sturdies Bay. The road leads me past a hardware store and I buy an extra bungee cord. Based on recommendations from others, I go to the Galiano Inn for pizza. I run into some of the same people from Café Boheme, which isn’t surprising considering there are maybe a half dozen places to eat on the island. The pizza is very tasty, but comes with a small helping of salad nestled on top of the center, which I find odd. Nevertheless I demolish both pizza and salad, somewhat to my surprise, although I will find myself eating more than I normally do throughout this trip. The Pizza place, and the Inn in general overlook the harbor where the ferry docks, and the grounds are beautiful and well manicured. The family from Café Boheme recommends a visit to the local bookstore, Galiano Island Books, and also that they like their rental, Paradise Rook. I notice that Canadians seem to use “For sure” in the same way people in Seattle say “Nice.” When they leave, I thank them for their suggestions and mention maybe we’ll run into each other again before I leave. “For sure!” they say. Biking back, I decide to take a roundabout route to Montague Harbor. On the brightly colored tourist map, the route looks like a simple loop. On a bicycle it turns out the road becomes a dirt track just as it enters a heavily wooded, uphill climb. I end up having to walk my bike about a kilometer before getting back to pavement. However, this detour is worth is as I learn about Bluffs Park, a natural area that was given to the people of the Island in the mid-1900s and is held in community trust. One of the nice things to see in small communities like this. 6:00PM: After resting and some yoga, I set out to find dinner. 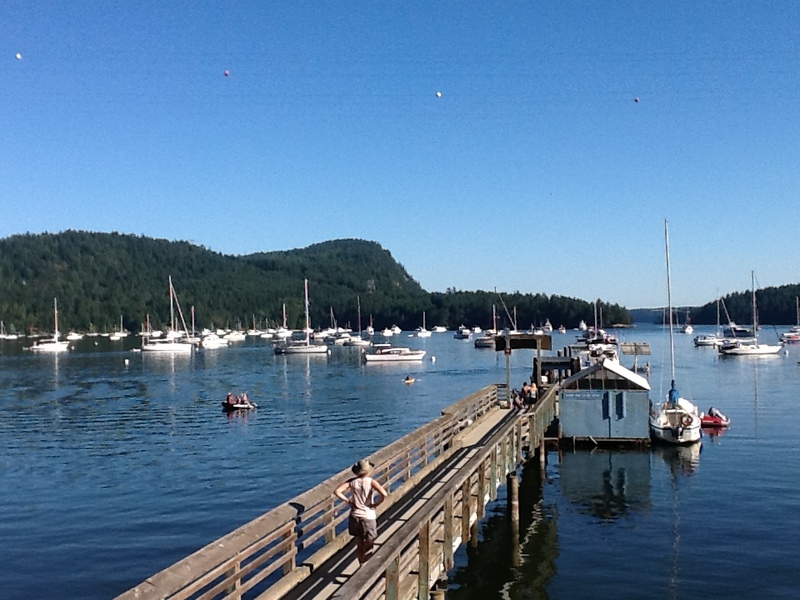 Montague Harbor is an incredibly lovely bay for mooring, and is dotted with boats and yachts of all sizes. However, while most of these people have cooking areas in their boats, if they’re sailing around the Southern Gulf Islands, they often want a change of pace. 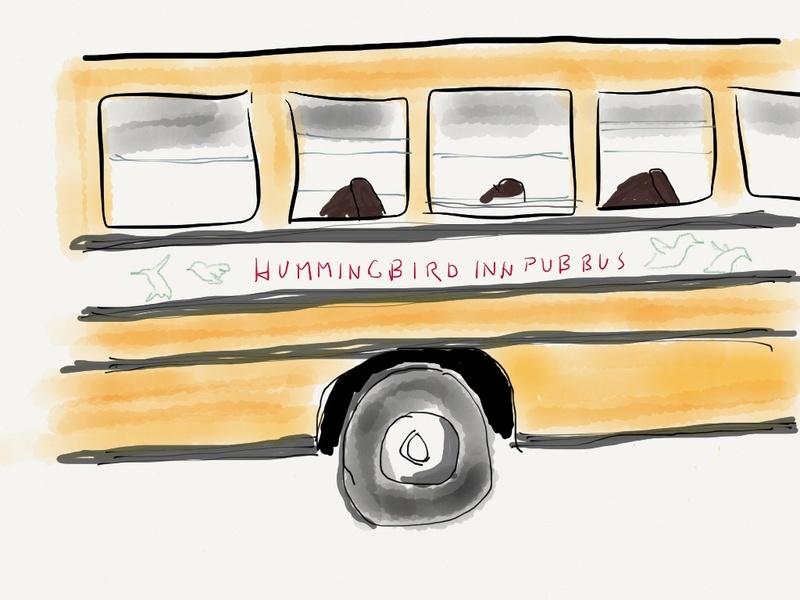 To meet this need, the enterprising people at the Hummingbird Pub have established the Hummingbird Bus, which comes down to Montague Bay every hour to ferry hungry boaters, and hungry campers, up to the Pub for dinner. Among other things, I realize my way of deciding how to frame my drawings is…odd. But that’s okay. An artist I am not. Paper by 53 has several different media types, including pen, colored pencil, watercolor brushes, and can do a variety of effects. Upon returning to camp, I drink some chamomile tea, watch a few episodes of the Big Bang Theory on my iPad, and fall asleep, anticipating the next day’s trip to Salt Spring Island.